I wasn't able to verify Dr. Baker's (VP of GE) prediction in 1957 of what the state of the television industry would be by 1960. He said 10 million sets would be sold in 1960 vs. 7.5 million in 1957. Some recent sources claim there were as many as 52 million TV sets total by 1960, so he might have been right. Transoceanic scattering techniques were thought to be the method of choice for television broadcasts, but we know that ultimately relay satellites would win out. It wasn't until 1962 that the Telstar bird carried the first TV signals, however. "Truly portable" transistorized TVs would be appearing on store shelves within the next couple years. One in forty American worked in the electronics manufacturing and service fields at the time. I'm guessing the ratio is a lot lower today with only a small percentage of any kind of manufacturing occurring domestically. Dr. W. R. G. Baker takes optimistic view, expects growth, but also change. 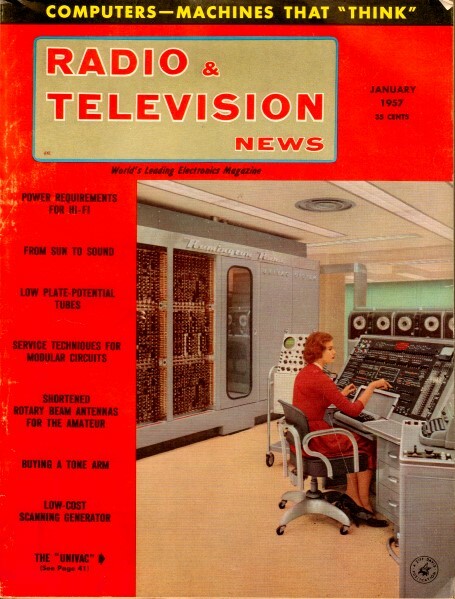 In his report to the fall meeting of the Institute of Radio Engineers and the Radio-Electronics-Television Manufacturers Association, Dr. W. R. G. Baker, president of RETMA and vice-president of the General Electric Company, anticipated a bright future for all facets of the TV industry. He accompanied his predictions with the observation that many forecasts for the electronics industry made in recent years turned out to be not optimistic enough. As compared to about 7 1/2 million TV sets being sold annually now, about 10 million a year will be the annual sale by 1960. Closed-circuit industrial TV will quadruple over the next four years, with sales, now at the $6 million mark, reaching $24 million by 1960. With the rapid development of scatter transmission techniques, trans-oceanic TV broadcasts are only a matter of time. With many other nations throughout the world ready to begin TV broadcasting for the first time in 1957, the sales potential for foreign markets will continue to forge upward. Truly portable transistorized TV sets will be on the market within two years. Color TV will always cost more than monochrome receivers, and there will surely be no drastic downward revision of color prices in the immediate future, although eventually less expensive color sets are in the offing. Looking into the immediate future, 1956 will end up as one of the best years for TV receiver sales despite the slackening off that characterized the first 9 months. On the u.h.f.-v.h.f. dispute, Dr. Baker advised a go-slow attitude until a thorough study has been made. Stating that there has been no precedent in industrial history for the growth of electronics, Dr. Baker pointed out, "Ten years ago it was an industrial infant and now it provides employment for one-and-three-quarter million Americans, which represents one person in every 40 in our total work force. And the amazing thing is that 75 percent of these jobs didn't exist just 10 years ago."